I got tired of being sick and lounging about so yesterday I jumped into action and started planting one of my new gardens beds. It is a large island bed that is home to a purple leaf plum. I was going to get rid of the plum but it was one of the few plants that my landlady has an emotional attachment to. I considered moving it but she was too worried it wouldn’t survive so I had to modify my plans. Not a huge set back in the scheme of things. I’ve wanted a mediterranean garden (lowercase m for describing the garden style. upperclass M for describing the region of the world) for a while now. It didn’t really matter where on the property it was. OK I know it doesn’t look like much. You have to remember that even though I live in California it is still February! 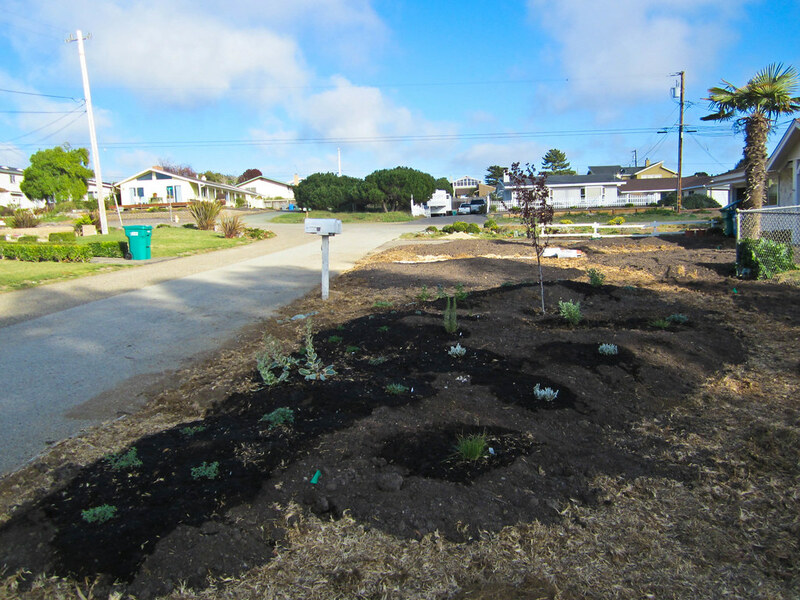 Just try and imagine what the plants will look like three months from now at the start of spring after months of cool weather and winter rains. Come on! I know you can do it! Stop laughing. 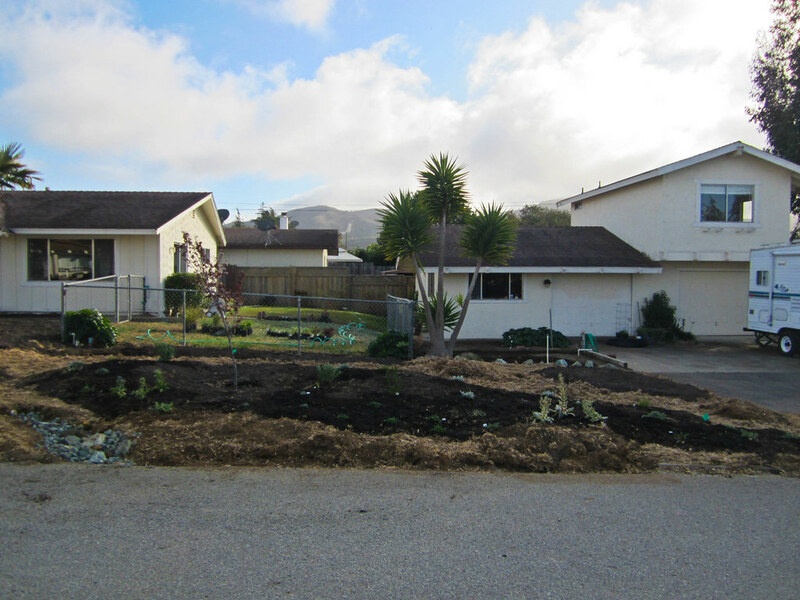 Picture the plants all big and in bloom and imagine that I have put down some nice mulch. Gardens always look a bit sad in photos when they are first installed and for a few moments I always despair a bit. But I have a mind that imagines gardens and I just walk around the bed picturing what each plant will look like once it is full sized and bursting with flowers. This isn’t just a garden for fun. Mediterranean style gardens are perfect for California so are a big share of the type of gardens I design. It was important to me to be able to grow and experiment with some of the plants that I use in designs. You can be an OK designer reading about a plants growing habits and dimensions and looking at pictures but I to be really good I think you need to grow the plants you work with. 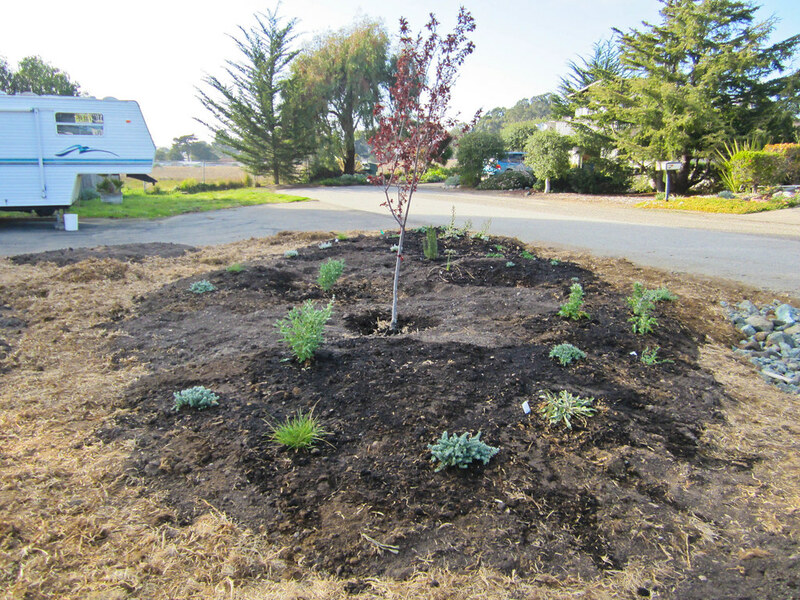 Most of the plants in this bed are from Native Sons, a wholesaler that specializes in plants for our mediterranean climate here in California. By growing their plants at home I can get a better idea of how these plants will look in future designs and play around with some nice combinations. 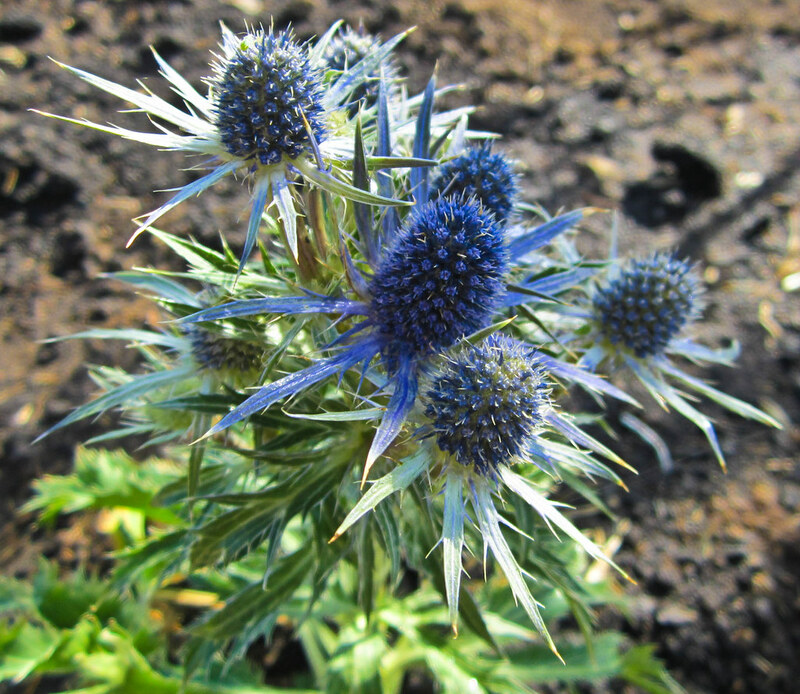 Eryngium ‘Sapphire Blue’ is a plant I have coveted since it first came on the scene about ten years ago. 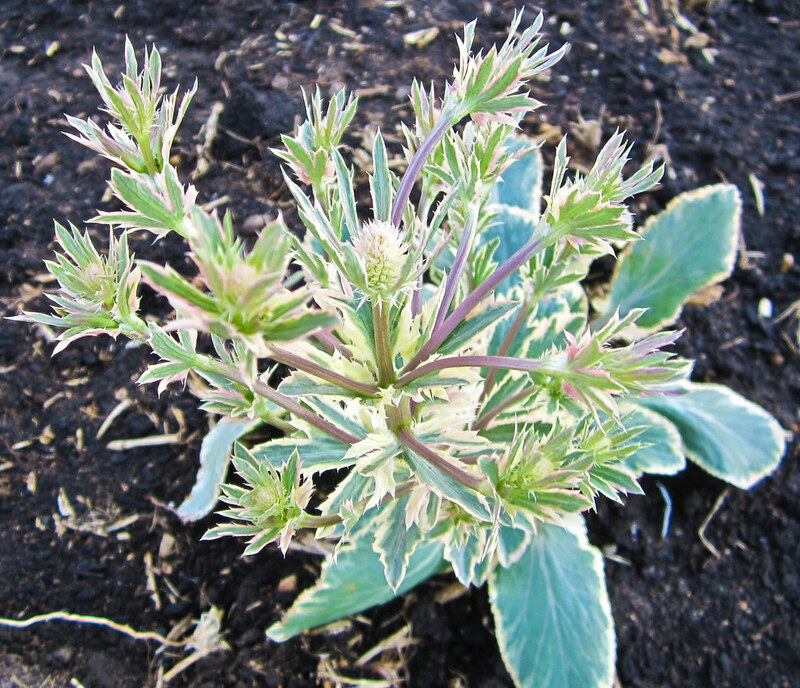 Eryngium planum ‘Jade Frost’ has beautiful variegated foliage that will really set off the metallic blue flowers once they color up. 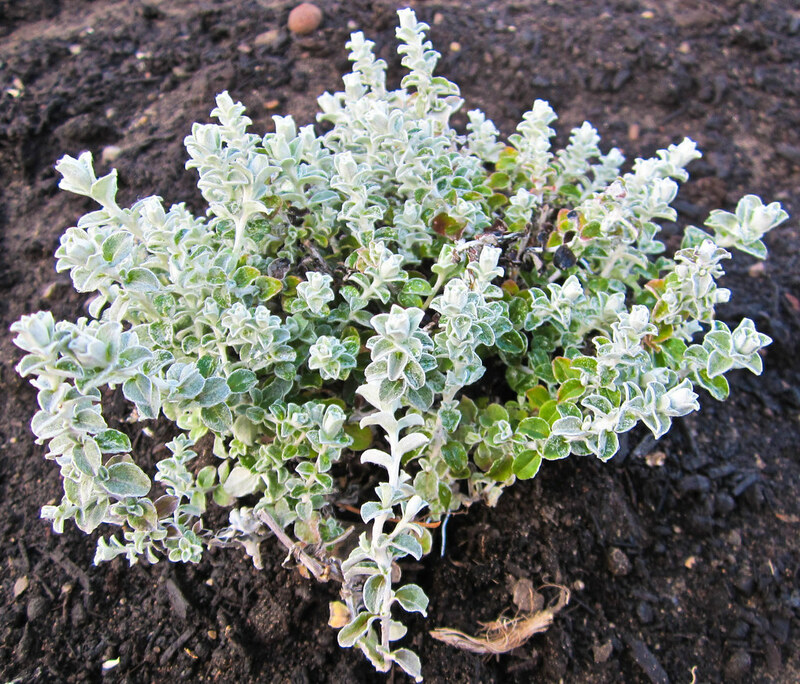 Dorycnium hirsutum is a small fuzzy leaved shrub with pale pinkish white pea flowers. At the bottom of the plant you can see a bit of the chicken wire sticking out that I used to cage the root balls of my plants. It was kind of a pain but worth the extra planting time protecting my plants from gophers rather than crying months from now when an established plant is devoured from under ground. The only plants I won’t cage and am confident won’t be eaten are Euphorbias. 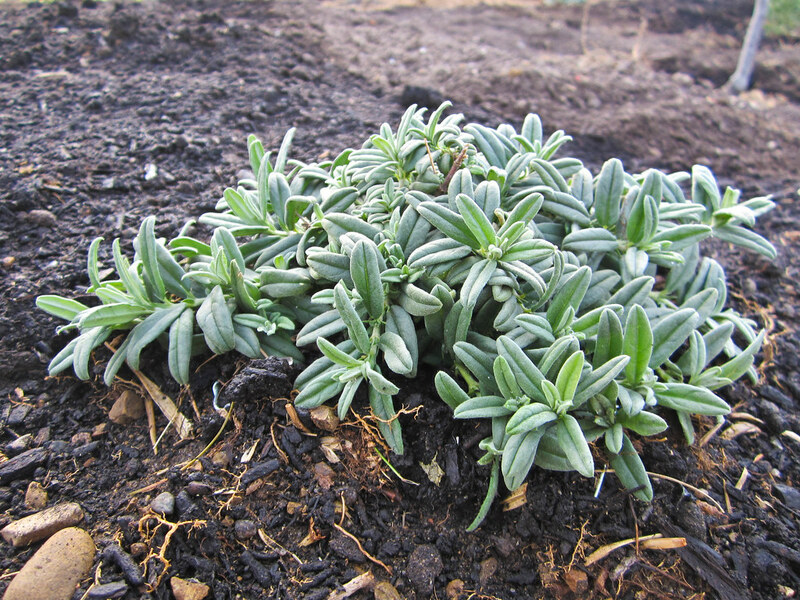 I also didn’t cage a rosemary, Salvia, and Nepeta as an experiment to see if the things that make them unpalatable to rabbits and deer will work against gophers. Plecostachys serpyfolia forms beautiful silver mounds about a foot tall and four feet across. Have you ever seen a plant in a book or magazine and coveted it for years before you could grow it? Maybe it isn’t something that will grow where you live. Maybe it is something that is so rare in the trade it took you forever to track one down. I still remember the first time I saw Helianthemum ‘Fire Dragon’. It was back when I was in school almost ten years ago and I was on a bus from NYC headed to my dads house for the weekend. 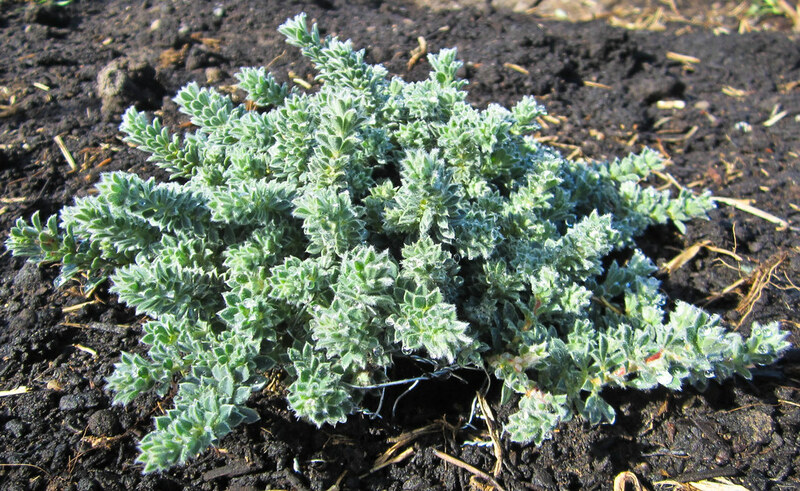 I was reading an article about a Colorado rock garden in a magazine that had just arrived and this plant caught my eye. I memorized the name and lamented the fact that I lived on the east coast where Helianthemums don’t do particularly well. Well when going over the list of plants available at Native Sons last week this name jumped out at me and I knew I had to have it for my garden! Just imagine in a few months it will be covered in tons of little reddish-orange flowers. I am really looking forward to seeing how this garden turns out. Aside from the plants pictured above the garden will feature Rosmarinus ‘Tuscan Blue’, Salvia ‘Aromas’, Nepeta X faassenii, Eschscholzia ‘Moonglow’ and ‘Buttermilk’, Scabiosa ‘Butterfly Blue’, Epilobium ‘Marin Pink’, Stipa gigantea ‘Pixie’, and Gaura ‘Whirling Butterflies’. There are still a few spots left for Lavenders (I’m still trying to decide which species and cultivars I want to grow) and some other choice plants. Remember I complained about birds attacking my mesembs and seedlings the other day? 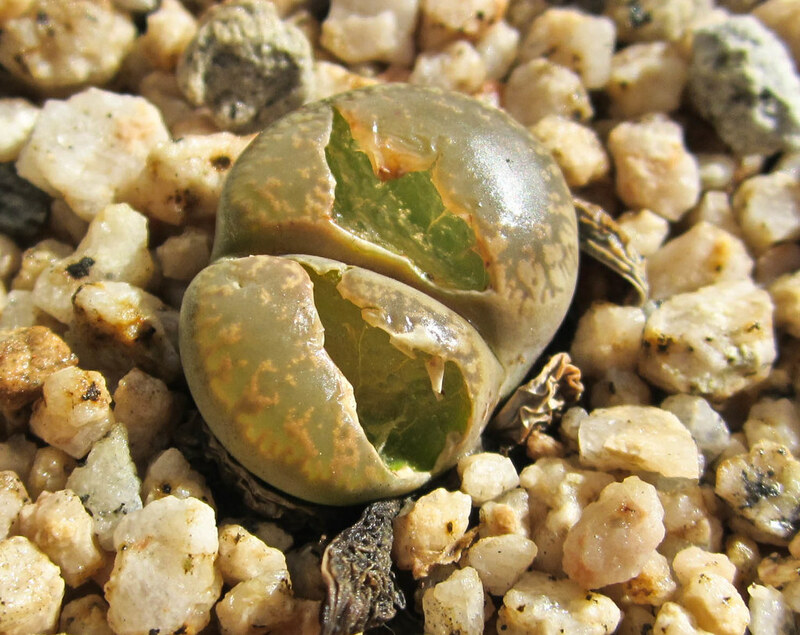 This is what a Conophytum that has been attacked by a birds beak looks like. And a Lithops. I might have thought they had burst from too much water if it wasn’t for the fact that other small plants were completely torn out of their pots and my nearby seedlings were also nibbled on and torn up. 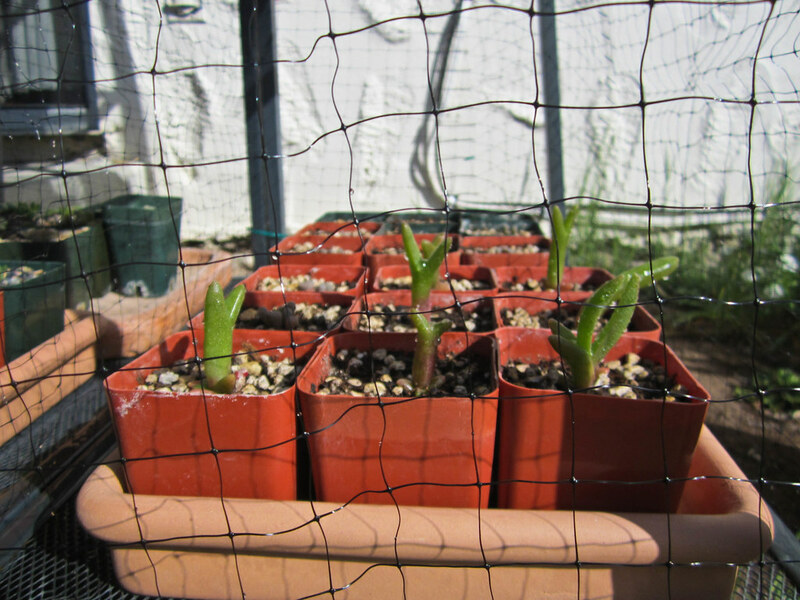 Now my precious little year old Mitrophyllum dissitum seedlings are protected with bird netting. I’m so relieved the bird didn’t find these plants. In fact all my seedlings are protected with bird netting now. Hopefully by next year I’ll have a greenhouse. On Tuesday I drove up to pick up the keys and drop off my plants. I am having movers pack up and move all my furniture and the rest of my belongings but obviously I don’t trust them with my plant collection. I brought up my camera and took a few photos of the new place. One last look at my plants in their own home. It doesn't really look like much but they still filled my Volkswagon. In anticipation of my move I haven't bought any plants the past year. Of course that just means this next year I am going to go crazy. 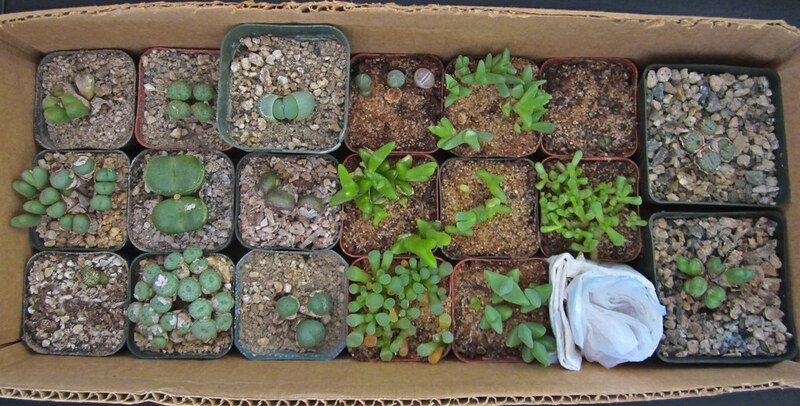 My Conophytums and seedlings packed up and ready to move. My new side yard. I am envisioning lots of plants from the restio and protea families. And maybe a little greenhouse. 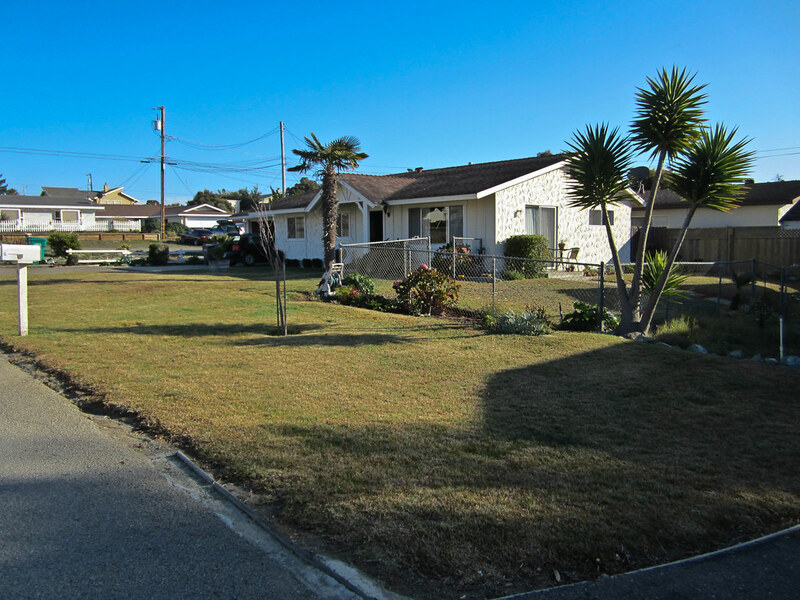 The front yard. I've already received permission to remove all the lawn. This will be my first project if I can afford it. There are a few things I would like to do in the front. The part in the foreground will probably be some large succulents or natives or other xeric plants. The central section in front of the fence I plan on doing some trial beds so I can try out new plants that I want to use in designs I am doing, and the area in the front out of the house will be very flowery (think trip to Annie's Annuals). Lots of native wildflowers up near the street and then some beds of poppies and other very floriferous things and maybe in the shady area right by the front door some neat Fuchsias. The fenced in side yard is where the septic tank is so I will leave that alone. 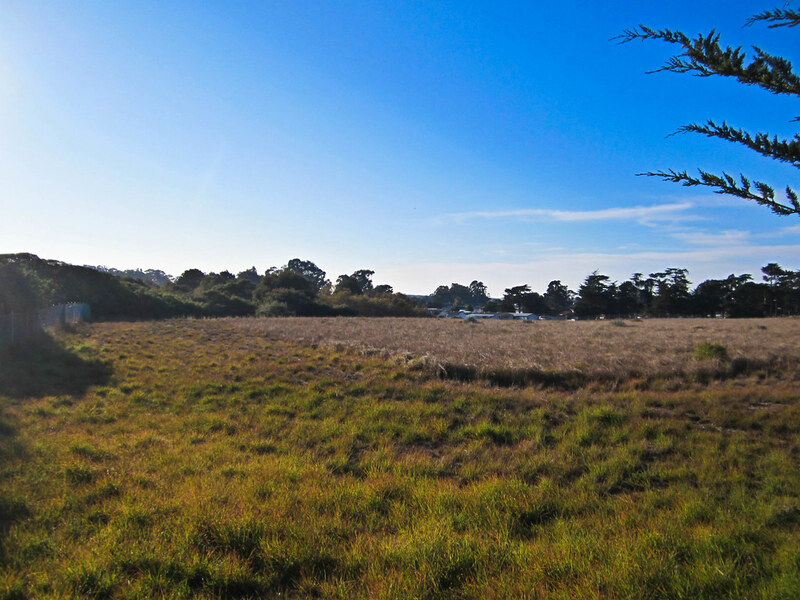 This field is at the end of my street. I bet it is full of flower eating bunnies. Before I headed back I drove up to admire some of the views in town. 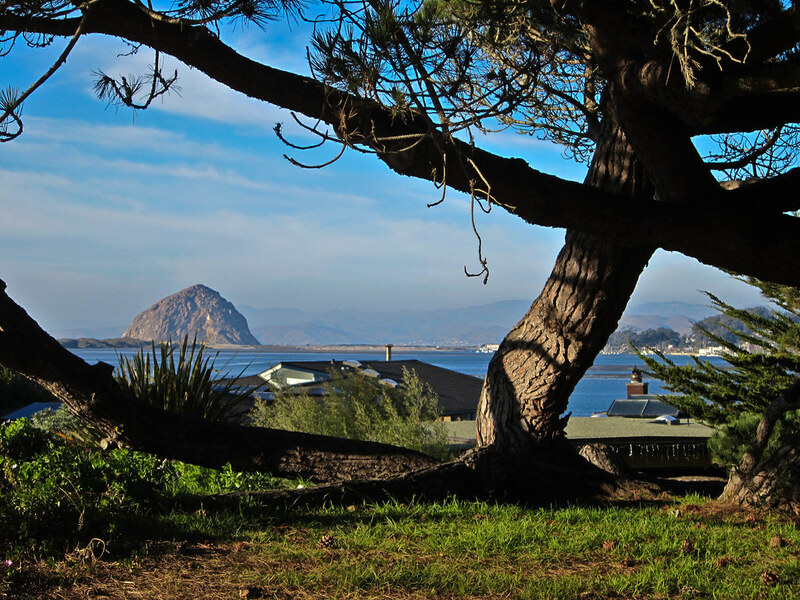 To the west is the bay and the Morro Bay sand spit. 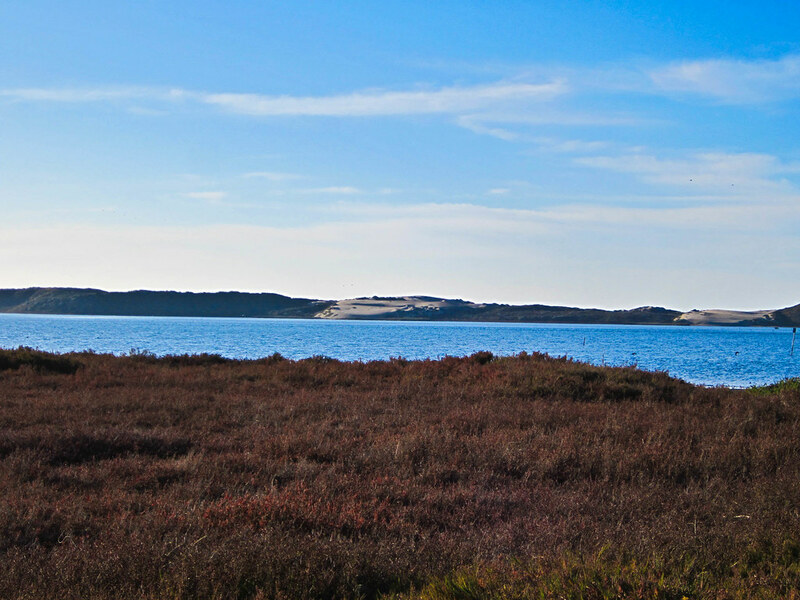 The Pacific Ocean is on the other side of the Morro Dunes Natural Preserve. 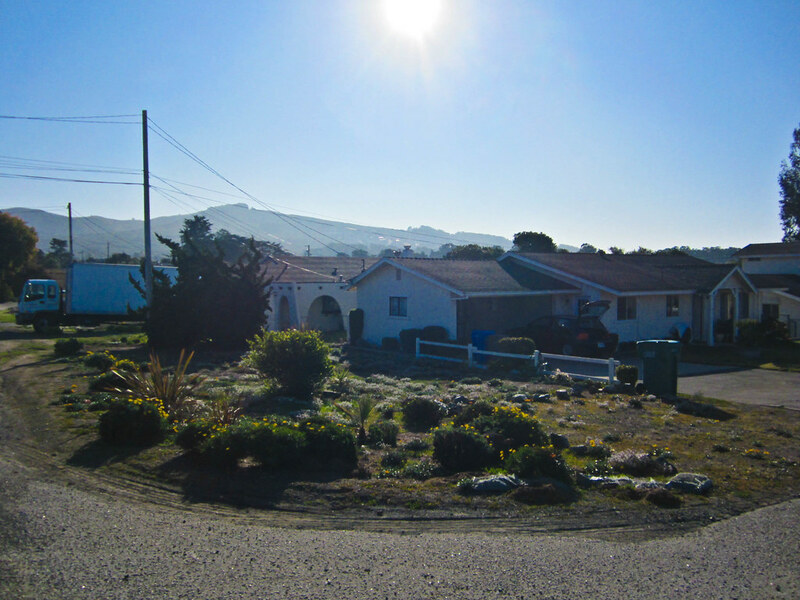 On the north side of town you can see the town of Morro Bay and Morro Rock. Well you can see them now. I expect there will be a lot of foggy days in the summer when they will be all but invisible behind a wall of grey. The Morro Bay Estuary separating Los Osos from Morro Bay. There is an elfin forest at the north end of town that I haven't checked out yet. So as you can see I have a lot to be excited about. Hopefully everything will go smoothly and I will have internet at my new place next Tuesday. One of the things I am most excited about is how quiet it was when I was up there. A welcome change from living in West Hollywood and being subjected to noisy neighbors, sirens, traffic noises, drunken club goers, and circling helicopters. And hopefully in the coming months I will have lots of great new garden photos to share. 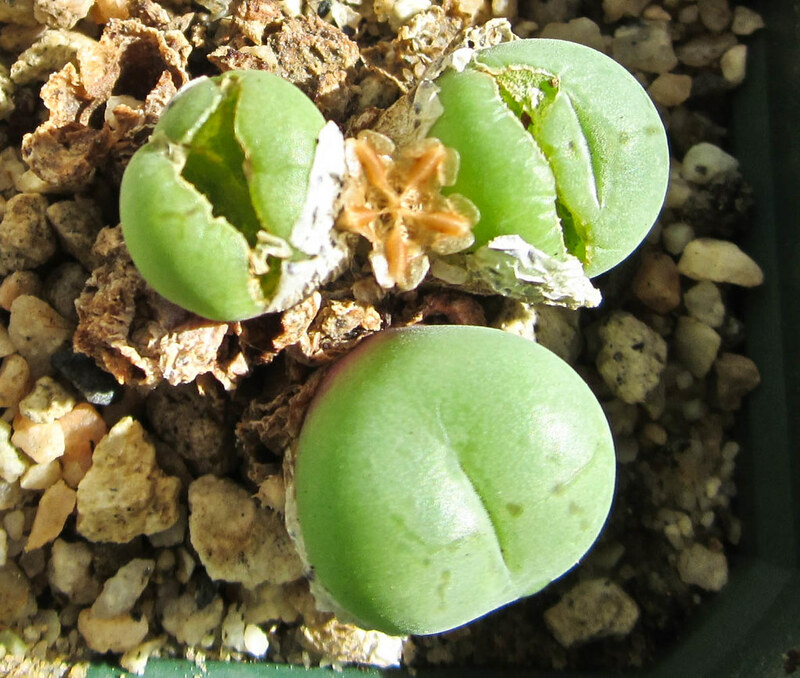 Conophytum Update, a set on Flickr. I had hoped to do photo updates of these day by day as they started greening up after receiving water on October 30th. This just wasn’t practical because A. for Conophytums the growth is often not really gradual. One day you have a shriveled lump and the next day you have perfect little green plants and B. I’ve just been way too busy. I did promise an update though and you can see that 23 days after being watered most of them are up and growing. Out of around a dozen plants it is looking like only 3 didn’t survive through dormancy. Only one bloom so far but fingers crossed a few more may in the coming weeks. This post is just a test to see which WordPress templates are easiest to add photos to without having to do a lot of resizing. 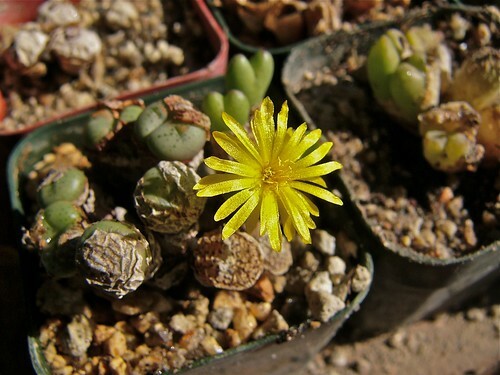 But do enjoy the photo of my first Conophytum bloom this year! This Conophytum piriforme is the first to bloom this season. It bloomed on November 8th just 9 days after being watered. Some of the others have been pretty slow to come out of dormancy. I think the combination of the poor conditions I am growing them in and the late start this year did some in but a few of them are returning to life even if it is slower than I had hoped. I'll post more photos as soon as I get this template thing sorted out. OK so which one works best? I find that WordPress formatting for photos is very awkward but I feel like just importing a bunch of photos from Flickr means that people don’t really look at all of them. Now I can play around with templates and see if any of these photo sizes work without needing to be modified. 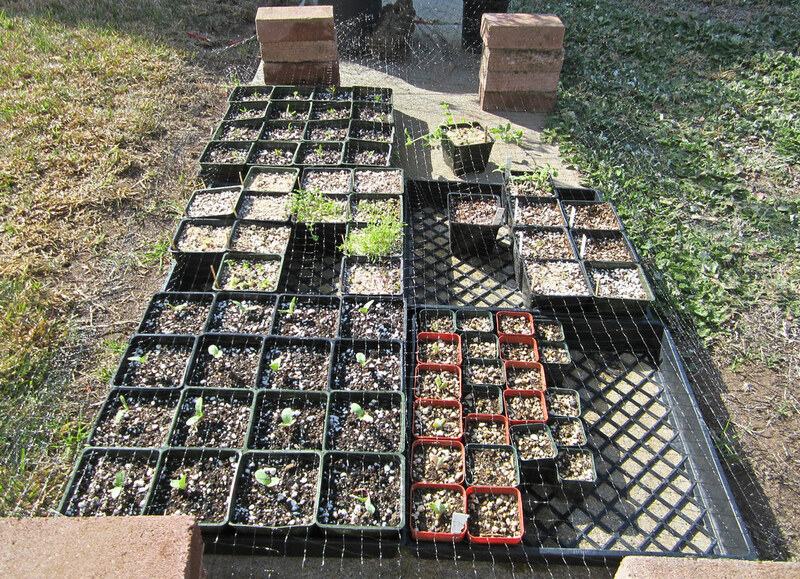 Mesemb Seedlings 11/4/11, a set on Flickr. Just wanted to post a Mesemb seedling update and a few more pictures of the ones coming out of dormancy. I planted them in two batches. Four last January and the other four in June. They really all should be potted up into their own pots by now but I just don’t have the space in my apartment. Hopefully when I move I will have more room for starting all sorts of different plants from seed. My favorite are the Frithia and Mitrophyllum. Overall most of these have been fairly easy so I am definitely going to try more in the future. And hopefully some day I will have a little greenhouse to keep them in. You can click each photo to bring you to Flickr and see larger versions. The macro shots of the Frithia are worth looking at larger. A few more dormant plants are starting to wake up and one is even about to bloom already! Dormant Mesembs Day 1, a set on Flickr. Four of the Conophytums already springing to life just a day after being watered. If you compare them to my last post you can see what a difference a day makes. Still quite a few to go but it is always a relief to learn that at least some of them survived. Dormant Mesembs Oct 2011, a set on Flickr. This is going to be a fun little photo journal over the next month or so. Conophytums and some other Mesembs go completely dormant for part of the year (spring and summer in this case). Some just go into a resting state but Conophytums and Monilaria wither away to papery shells. They look pretty dead. But just under the surface they are already starting to grow. All they need is a bit of water to mirror the start of the rainy season in their home of South Africa. This year my plants were slow to go dormant. 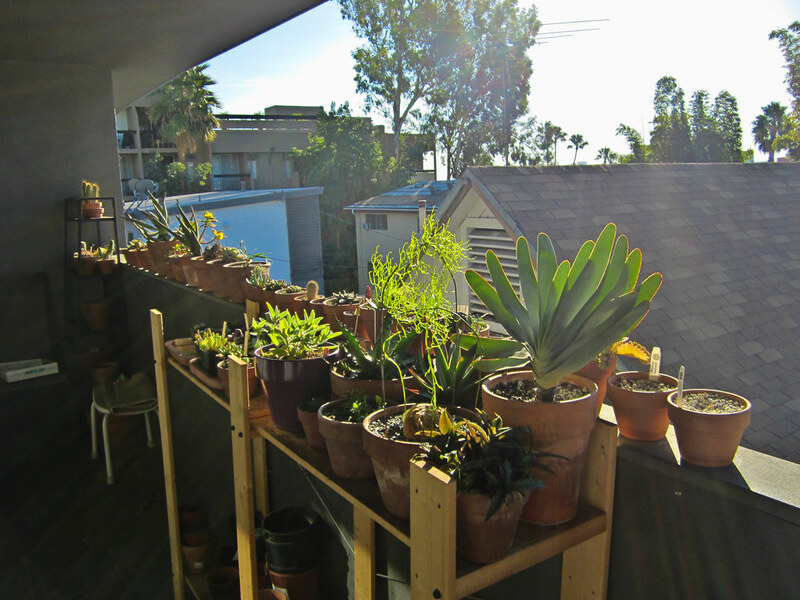 I believe it is because of my balcony being so shady in spring and summer because of the roof overhang. Even after withholding water for a while some of them remained a bit more fleshy and green compared to last year. In 2010 I watered them on October 3rd but this year I decided to withhold water until the end of October because of their late start. I’m glad I didn’t wait any longer. They were so dry the soil exploded in clouds of dust when the water hit. It is always fun to watch the results. Their rejuvenation is rather dramatic. In just a few short days most of them will quickly show signs of life and in less than a month they will go from papery husks to little green buttons covered in blooms. It is always a bit of a lottery. Did they survive dormancy? Will they bloom? Did they split and multiply while they were dormant? Check back over the next month as I will try to post updates every few days! I’m definitely no expert when it comes to these little plants. The best place to buy them is at succulent society shows where they are rather affordable. Most of mine were just $3 to $6 a pot. Seed is readily available too but I haven’t had luck with that yet. The seedlings are very tiny and die pretty easily. Well worth giving these little guys a try though if you can find them and have a sunny windowsill. So far I find them easier than the more commonly available Lithops.